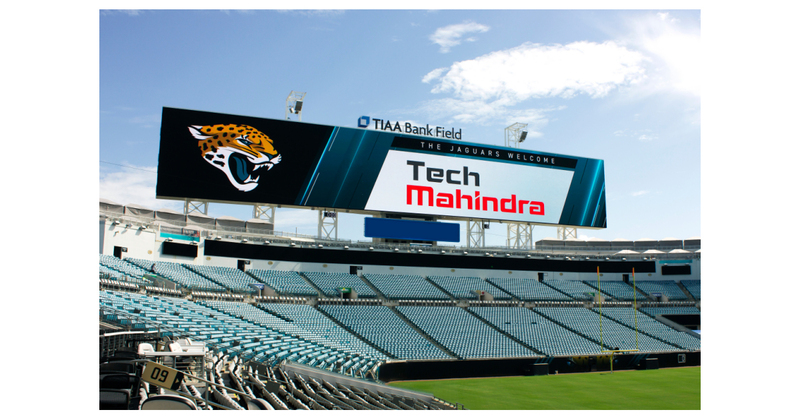 JACKSONVILLE, Fla.–(BUSINESS WIRE)–Tech Mahindra, a leading provider of digital transformation, consulting and business re-engineering services and solutions today announced a partnership with the Jacksonville Jaguars. As the Technology and Analytics Partner and Digital Strategy Partner of the Jaguars, Tech Mahindra will provide next generation digital technology expertise, such as artificial intelligence and advanced analytics, to enrich the fan experience and create front office efficiencies. Tech Mahindra represents the connected world, offering innovative and customer-centric information technology experiences, enabling Enterprises, Associates and the Society to Rise™. We are a USD 4.9 billion company with 113,550+ professionals across 90 countries, helping over 926 global customers including Fortune 500 companies. Our convergent, digital, design experiences, innovation platforms and reusable assets connect across a number of technologies to deliver tangible business value and experiences to our stakeholders. Tech Mahindra is amongst the Fab 50 companies in Asia (Forbes 2016 list). We are part of the USD 21 billion Mahindra Group that employs more than 200,000 people in over 100 countries. The Group operates in the key industries that drive economic growth, enjoying a leadership position in tractors, utility vehicles, after-market, information technology and vacation ownership. Learn more about Mahindra on www.mahindra.com / Twitter and Facebook: @MahindraRise. The Jacksonville Jaguars are a professional football team, one of 32 member clubs of the National Football League (NFL), aligned in the South Division of the American Football Conference (AFC). Founded on Nov. 30, 1993, the team began play as an expansion team in 1995 and is in its 24th season of competition in 2018. The team is owned by Shahid Khan, who purchased the franchise in January 2012. The club plays its home games at TIAA Bank Field, located near the St. Johns River in downtown Jacksonville, Fla. Since their inaugural season in 1995, the Jaguars have won three division titles and made seven playoff appearances, playing in 14 postseason games. The Jaguars were AFC South champions in 2017 and won two playoff games en route to their third AFC Championship game appearance.